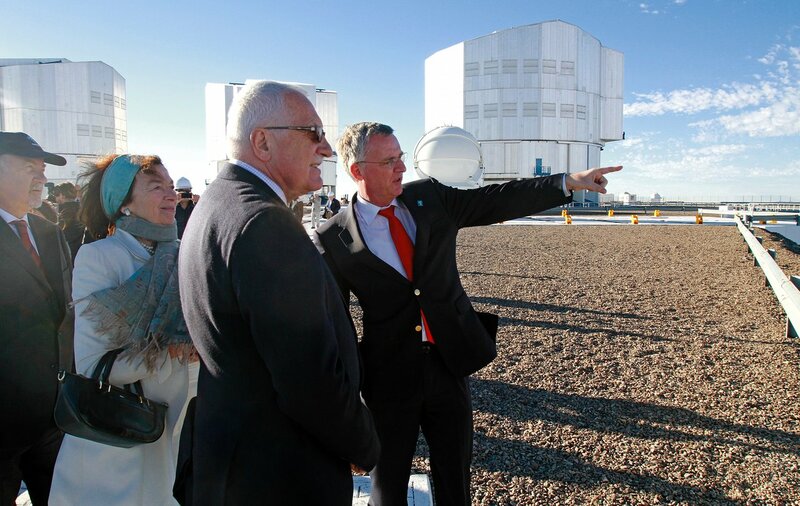 On 6 April 2011, the ESO Paranal Observatory was honoured with a visit from the President of the Czech Republic, Václav Klaus, and his wife Livia Klausová, who also took the opportunity to admire Cerro Armazones, the future site of the planned E-ELT. The distinguished visitor was shown the technical installations at the observatory, and was present when the dome of one of the four 8.2-metre Unit Telescopes of ESO’s Very Large Telescope opened for a night’s observing at Cerro Paranal, the world’s most advanced visible-light observatory. “I'm delighted to welcome President Klaus to the Paranal Observatory and to show him first-hand the world-leading astronomical facility that ESO has designed, has built, and operates for European astronomy,” said ESO’s Director General, Tim de Zeeuw. From the VLT platform, the President had the opportunity to admire Cerro Armazones as well as other spectacular views of Chile’s Atacama Desert surrounding Paranal. Adjacent to Cerro Paranal, Armazones has been chosen as the site for the future E-ELT (see eso1018). ESO is seeking approval from its governing bodies by the end of 2011 for the go-ahead for the 1-billion euro E-ELT. Construction is expected to begin in 2012 and the start of operations is planned for early in the next decade. President Klaus was accompanied by the Minister of Foreign Affairs of the Czech Republic, Karel Schwarzenberg, the Czech Ambassador in Chile, Zdenek Kubánek, dignitaries of the government, and a Czech industrial delegation. The group was hosted at Paranal by the ESO Director General, Tim de Zeeuw, the ESO Representative in Chile, Massimo Tarenghi, the Director of Operations, Andreas Kaufer, and Jan Palous, Czech representative at the ESO Council. After the opening of the telescopes, President Klaus had the opportunity to enjoy the spectacular sunset over the Pacific Ocean from the VLT platform. Then he visited the VLT control room, which operates the four Unit Telescopes and the VLT Interferometer (VLTI). 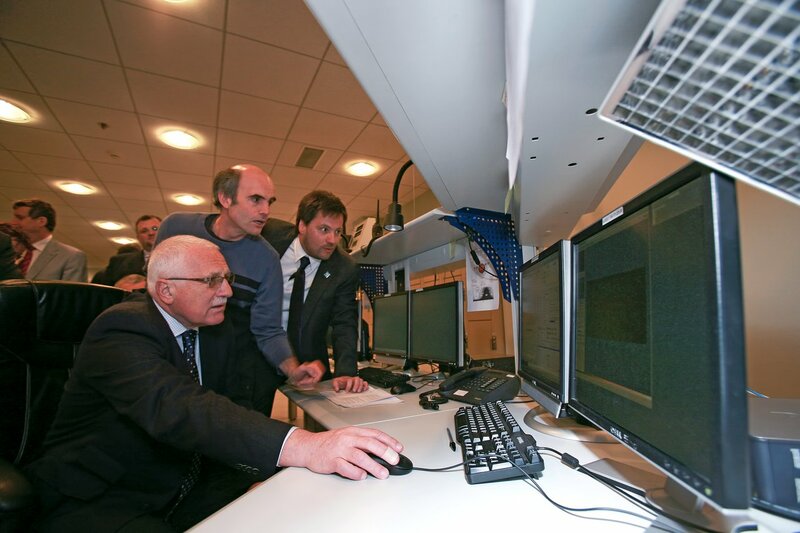 Here, the President took part in the start of observations from the console of one of the VLT Unit telescopes.